For our anniversary we headed off to Patisserie Valerie for afternoon tea. 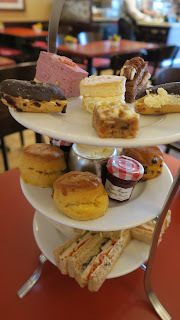 I've had a lot of afternoon tea but what really stood out about the one at Patisserie Valerie was the balance. The choux pastry wasn't the crispest and neither was the pastry on the reheated mini quiches but that didn't matter as much because the balance of the whole thing was just right. What Makes A Perfect Afternoon Tea? I've never thought before that afternoon tea could be unbalanced but I've often left the table feeling I've eaten too much cake. If it's on my cake stand I'll eat it, it's not until half an hour later I'll realise I ate too much and by then it's too late. Once I started was marvelling over how I'd had just the right selection of sandwiches to be satisfied, ready for scones and still had room for cake too, I realised just how difficult it is to offer a range of tasty morsels without over filling a guest. Patisserie Valerie have perfect portion sizes with their afternoon tea. Five dainty finger sandwiches per person with a range of fillings. We had finely sliced cucumber, chicken pesto, salmon and cream cheese, egg mayonnaise plus ham with spinach and mustard. Two mini scones each with a more than generous amount of clotted cream and Bonne Maman jam. And cute little two bite cakes which we shared, only one rich chocolatey one, and the other five which included two éclairs were incredibly light. Plus, decent refillable coffee. Great value for £25 for two people. I've never eaten in Patisserie Valerie before and had dismissed it as a faceless chain. The cakes are handmade but not on site and that always put me off. But the staff were so attentive and friendly plus the window display is just divine. The venue in Shrewsbury town square had a very quaint tea shop feel. I felt replete after finishing afternoon tea, not overly stuffed with cloying cakes and sweet stuff. Like goldilocks and her porridge, this one was just right.